In this modern world where individualism and bad take over the good, the essential is quickly forgotten even if it could be sum up with a kiss. For AlexyP, the only way to fight this “bad” is to take time to love. 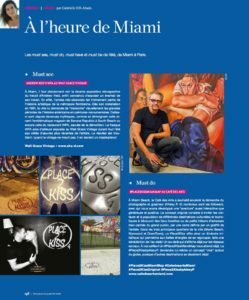 This is why he started painting these place2kiss, little places dedicated to love and tenderness of a simple kiss. 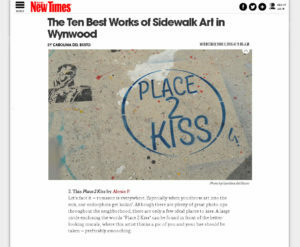 A painted circle on city sidewalks all over the world with a writing inside: place2kiss. What follows is up to you, lucky walkers who end up on this inscription, who writes: a kiss on the hand,a smack on the mouth, on the cheek or a real French kiss. In fact why wait for Christmas and its tradition to kiss under the mistletoe when you can find a place around the corner on the street where you can kiss all year round? 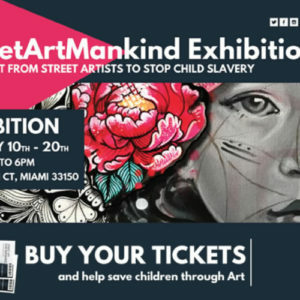 http://www.miaminewtimes.com/arts/the-ten-best-works-of-sidewalk-art-in-wynwood-8482210 The post Miami New Times appeared first on Place 2 Kiss. 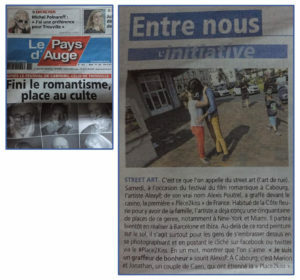 The post Newspaper feature – Le Pays d’Auge appeared first on Place 2 Kiss. 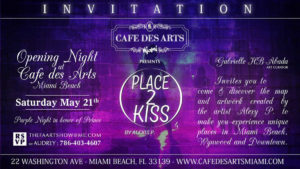 The post Event at Cafe des Arts Miami appeared first on Place 2 Kiss. The post Article by Gabrielle HB-Abada appeared first on Place 2 Kiss.